I recently became aware of a cool tool on Facebook that allows me to do some free, easy, and non-nefarious sleuthing of my competition. Want to know what that tool is? Watch my 9-minute video and find out! I am holding a two-day UNCOPYABLE IMPLEMENTATION BOOT CAMP in Seattle, WA on January 9 & 10, 2019. If you’re interested in attending, Click Here. They announced this in April and it became live in June I believe. I frequently use it to get reference back to fantastic ads that I see. Others are much better copy writers and sometimes I can’t explain my vision to a photographer or videographer so I reference these ads. Great thinking, Trenton! That’s another excellent way to steal ideas! 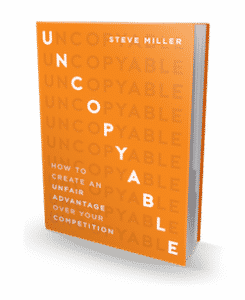 One of the sayings I love from the book (I’m referring to a certain #1 Best Seller called UNCOPYABLE) is, “Look at what everyone else is doing, and don’t do it.” The intel you’ share in this video provides a tool to do the opposite: see what others are NOT doing, and take advantage of the gap. A great tool to differentiate your brand, company and marketing. I’ll be sharing this tip with a lot of people! I have to echo what Kay said. It’s not just about knowing the tool exists, it’s about understanding how you can use that tool – and demonstrating how to use it. Thank you for doing it so well.